[99 Pages Report] The global virtual private server market size is expected to grow from USD 2.4 billion in 2018 to USD 5.0 billion by 2023, at a Compound Annual Growth Rate (CAGR) of 15.3% during the forecast period. Major growth drivers for the market include several advantages of VPS such as availability of cost-effective virtual private server, provide greater customizations, and scalability and more control with virtual servers than shared hosting. VPS enables organizations avail dedicated servers in the virtual environment. The approach provides enhanced control over servers, agile deployment of virtualized workloads, reduced infrastructure cost, and improved operational efficiency. With increasing virtualization, Small and Medium Enterprises (SMEs) are embracing both private and public cloud services to transform their business processes. The adoption of cloud services has, in turn, spurred the demand for virtual private server market for hosting and for supporting other critical business functions. The report provides detailed insights into the VPS market by operating system, organization size, vertical, and region. Organizations use VPS for their Windows and Linux applications. Linux VPS is one of the best options if a user wants more control over the things that have been installed on the server where the website has been hosted. Linux VPS provides with a multi-tenancy feature, which means allocation of resources, such as email accounts or disk space can be done easily. Linux VPS is easy to install and viable to deploy tools and add-ons as per user’s requirement. Thus, the Linux segment is expected to register higher growth in adoption. The VPS market has been segmented by organization size into large enterprises and SMEs. Currently, the market share of the large enterprises segment is estimated to be higher; however, the market size of the SMEs is expected to increase at a higher CAGR in the coming years. The growing awareness of the benefits of VPS and the business expansions by global vendors in the SMEs segment are expected to be driving factors for the growth of VPS market. 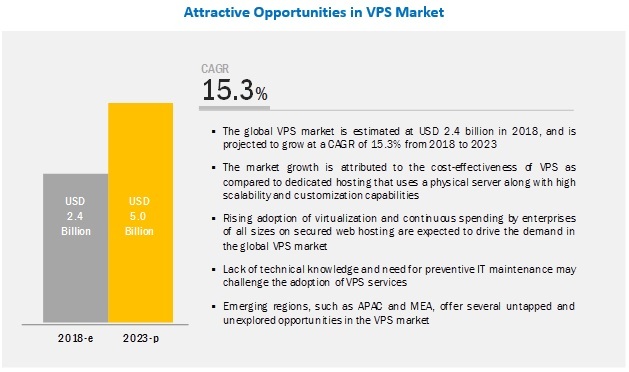 APAC is expected to offer significant growth opportunities for VPS vendors during the forecast period, as enterprises and SMEs across industry verticals are now adopting VPS services owing to its numerous advantages over traditional and physical servers. Additionally, the emergence of many startups within the VPS market across APAC is expected to drive the market here. China, Japan, and India have significant potential for the global VPS vendors, because of the availability of significant proportion of end-user verticals, favorable economic conditions by extending services to these regions, multifold increase in the adoption rate of virtualization environment-based applications, and absence of intense competition for market entrants. The APAC region has always been cautious about investment plans in terms of funding, and hence the enterprises in the region are turning toward the adoption of affordable VPS. Major vendors in the global VPS market include AWS (US), United Internet (UK), GoDaddy (US), Endurance International Group (US), OVH (France), DigitalOcean (US), Plesk (Switzerland), Rackspace (US), A2 Hosting (US), Liquid Web (US), Linode (US), Vultr (US), DreamHost (US), InMotion Hosting (US), and TekTonic (US). Rackspace, a leading managed cloud company, was founded in 1998 and is headquartered in Texas, US. It is a global hosting, cloud, and IT services company. Its product portfolio consists of public and private cloud services, network services, storage services, infrastructure and developer tools, and email hosting services. It offers robust support for VMware, AWS, GCP, Microsoft Azure, and OpenStack Cloud. It caters to customers in more than 120 countries. The company has a strong presence in Europe, North America, Latin America, and APAC. Rackspace provides managed cloud services, managed hosting services, colocation services, application services, professional services, and security and compliance services. The company offers its products and services to more than 300,000 customers. Additionally, it offers IT transformation, application transformation, and database platform services. It maintains healthy partner relations with potential companies, such as HPE, AWS, and Cloud Technology Partners (CTP). It caters to various verticals, including education, finance, healthcare, government, manufacturing, retail, and business services. In September 2017, Rackspace acquired Datapipe, a US-based leading provider of managed hosting services and data centers, to expand its presence in the professional services and traditional colocation services space. In September 2016, Rackspace extended its agreement with Microsoft to enhance its application hosting services that provide customers 24/7 access to applications and Microsoft Azure experts. Where will all these developments take the industry in the mid to long-term? What are the upcoming verticals for the VPS market? Which are the leading vendors operating in this market? The study involved 4 major activities to estimate the current market size of the virtual private server market. Exhaustive secondary research was done to collect information on the market, the peer market, and the parent market. The next step was to validate these findings, assumptions, and sizing with industry experts across the value chain through primary research. Both top-down and bottom-up approaches were employed to estimate the complete market size. After that, the market breakup and data triangulation procedures were used to estimate the market size of the segments and subsegments. In the secondary research process, various secondary sources were referred to for identifying and collecting information for this study. The secondary sources included annual reports, press releases, and investor presentations of companies; whitepapers; certified publications; and articles from recognized associations, such as data center knowledge and government publishing sources. Secondary sources considered for the study included Factiva and D&B Hoovers. 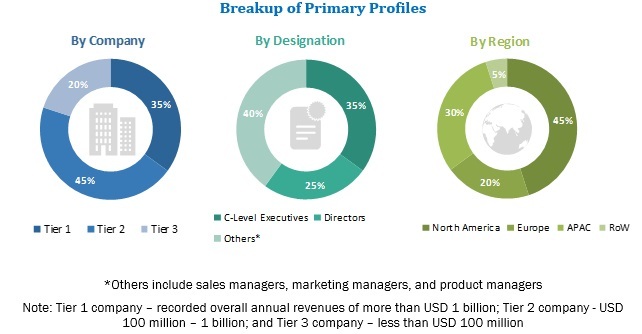 Secondary research was mainly used to obtain key information about the industry’s value chain, the total pool of key players, market classification and segmentation as per the industry trends to the bottom-most level, regional markets, and key developments from both market and technology-oriented perspectives. In the primary research process, various primary sources from both supply and demand sides were interviewed to obtain qualitative and quantitative information for this report. Primary sources from the supply side included industry experts, such as Chief Executive Officers (CEOs), Vice Presidents (VPs), marketing directors, technology and innovation directors, and related key executives from various key companies and organizations providing VPS. The primary sources from the demand side included the end users of VPS, including Chief Information Officers (CIOs), IT technicians and technologists, and IT managers at public and investor-owned utilities. After arriving at the overall market size—using the market size estimation processes as explained above—the market was split into several segments and subsegments. To complete the overall market engineering process and arrive at the exact statistics of each market segment and subsegment, the data triangulation and market breakup procedures were employed, wherever applicable. The data was triangulated by studying several factors and trends from both, the demand and supply sides, in the virtual private server market.